With a convenient location in central Rome, this luxurious hotel is the perfect destination for sightseeing, relaxation and pampering. Watch the crowds as you sip cappuccino along a sidewalk, then venture out to discover the city's many treasures at your doorstep. When you return, unwind with a cocktail by the rooftop infinity pool as you catch the sunset over the city skyline. Rooms and suites perfectly blend timeless style and modern function, for a comfortable stay. 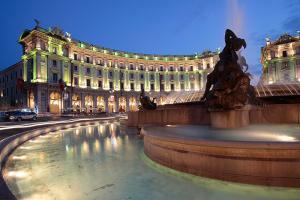 In in Rome's city center, approximately 20 miles from the international airport.